Q: We estimate Epics and their child Features. When the Epic is estimated the sum of Features underneath it should not exceed the estimation of the Epic. Moreover, the sum of User Story effort under one Feature should not exceed the estimation of that Feature. 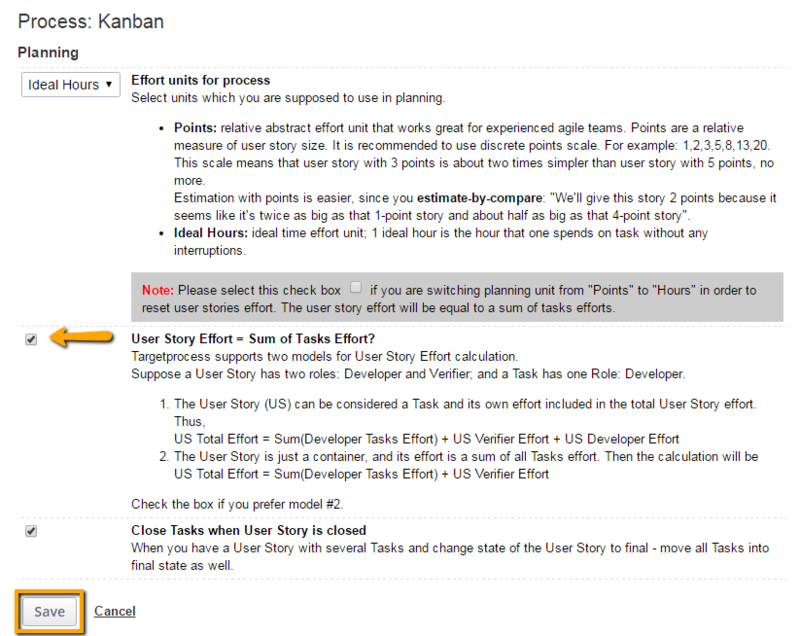 Finally, the estimation of all Tasks created under one User Story and assigned i.e. to a developer or a QA engineer or a designer should not exceed the estimation of the role estimation of the whole User Story. We will create a list that will show all Epics. It will compare initial estimation of an Epic and sum of effort of its features. And we'll apply color highlighting when total effort exceeds initial estimation. Initial estimate. Value to this field is set manually. It is not changed further by automatic re-calculations. Effort. Value to this field is provided automatically. It is calculated as total effort of all features under the epic. We'll compare Initial estimate and Effort in the Visual encoding rule. Create a list view that shows Epics as rows (cards). On the Customize Cards tab, configure columns for your list view. Add Initial estimate, Effort, Open/total Features and Time spent/time remaining columns. Finish setup of the view. Whenever an initial estimate of an Epic is less than a sum of effort of its Features the Epic is colored into red. A similar view can be created for Features as well. Initial estimate: The value for this field is set manually. It is not changed further by automatic re-calculations. Effort: The value of this field is provided automatically. It is calculated as the total effort of all User Stories under the Feature. If a Feature has User Stories inside, its effort is equal to sum of effort of each User Story. Otherwise the effort of a Feature is equal to its initial estimation. Create a list view that shows Features as rows (cards). It is also possible to select Epics as a 2nd hierarchy level. On the Customize Cards tab, configure columns for your list view. 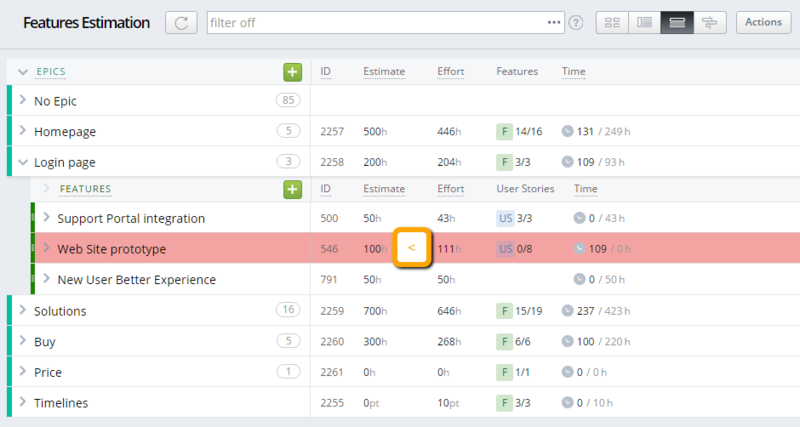 Add Initial estimate, Effort, Open/total User Stories and Time spent/time remaining columns. Finish setup of the view. Whenever an initial estimate of a Feature is less than the sum of effort of its User Stories, the Feature is colored into red. On the User Story level there is no Initial Estimate field. Instead, for each User Story you enter effort per role. You can configure list of roles available for personal assignments and whether it is possible to estimate effort for each role or not. Every role has "Has Effort" checkbox in its settings. Settings are global across all your account. Manage settings for roles in Settings → Roles page. Total effort for every User Story always consists of own story effort and sum of effort in its Tasks. This ratio is preserved for all roles in a User Story. Find more details about effort and progress calculation for User Stories and Tasks in Targetprocess. Own effort for User Story is set on its details view. It is not possible to set or limit total effort for a User Story. It is always split by roles. It is also not possible to limit total role effort calculated across Tasks with the initially estimated role effort for a Story. Effort for a Task or a User Story can be increased by Story editors whenever needed. However the effort field of a User Story is not useless. It is still possible to create roughly estimated Stories and then refine them with Tasks. Moreover, there is built-in automatic rule that may serve as a helpful solution for this use case. When new child Task is added to a User Story, then the effort for a role of this Task can be automatically subtracted from the User Story effort of the same role. Here is how to activate and use this solution. Estimate effort for every Task. Whenever you input effort for a role in a Task, it will be reduced from total role effort in the parent User Story. It is not possible to lock and limit total effort for any of these entities so far. It is only possible to compare Initial Estimate and Effort as it is described above. 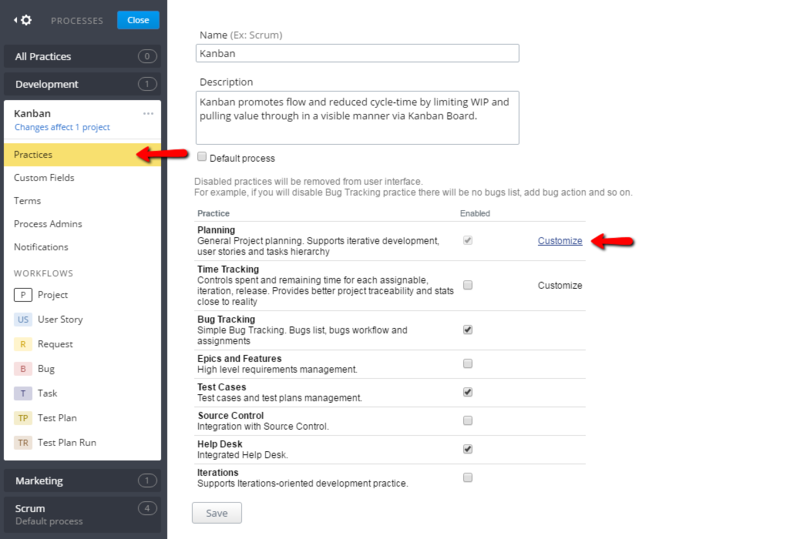 For any entity it is also possible to introduce special custom fields and fill them manually. For example, you would like to track historical estimation for every User Story. Add special custom field with name "HistoricalEstimate". Fill it in whenever needed. The field won't be recalculated by the tool automatically and you will be able to compare historical estimates and actual efforts for all User Stories. Do not use 'InitialEstimate' as a name for your custom fields. It is reserved and may break your reports.